On the drive to the bike path I passed a feral cat colony. I stopped a few times a week just to talk with the cats and get to know them, and in August I noticed two of the mama cats were pregnant. Since I had eight and nine-year old rescue cats at home, I'd been thinking about adding a kitten to liven things up. I told my husband and son that if there was a really pretty kitten, I might have to bring it home. Around the beginning of September ten kittens were born. The mama cats brought the kittens to the old coal shed for shelter where I discovered one Siamese kitten among the ten! Since there were no Siamese among the adults in the colony I was very surprised. As I visited each day I talked with the kittens and little Possum Blue was always the second kitten out of the box when he heard my voice. 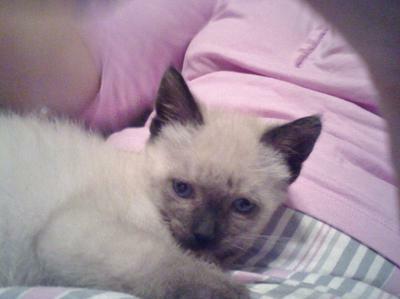 Possum was just a little fluff ball of white with gray points and blue eyes. I waited as long as I dared before taking him home, not wanting to remove him from his family too soon, but when ten days of hard rain was predicted I felt it was time. The vet says he was about five to six weeks old. He was able to eat canned food and kitten milk replacement on his own but still needed stimulation to poop and pee. Within ten days he was completely able to 'go' on his own and was using the litterbox like a champ. He weighed only 14 ounces! He's now four and a half months old and weighs 6.5 pounds. His points have darkened considerably and he is probably a seal point, and a traditional or old-fashioned Siamese body type. The fellow who looks in on the feral cat colony daily tells me my Possum Blue is only the third Siamese he's seen in the colony in four years, and neither of those two are still part of the group. My nine-year-old Turkish Angora mix has taken to Possum and plays with him and keeps him in line when he gets too rambunctious. Our eight-year-old still isn't thrilled about the little intruder but it has only been three and a half months since Possum Blue joined our family. He had no problem winning over the humans in the house with his silly kitten antics, adorable coloring, sweet face and amazing amount of energy. One item of interest that perplexes me, but is not unpleasant is that our Siamese does NOT talk! If he gets shut into a closet or cupboard by accident it's the only time we hear a distressed "Meep!" I've had cats for over forty years, but this guy is my first Siamese. I absolutely adore his unique personality and look forward to all the years we'll spend together. Jane V.
Thanks so much for your story, Jane. How lovely to find a kitten with Siamese coloring in such a large litter. While it's unusual, it's not unheard of for feral litters to contain kittens with Siamese coloring; one of the parents must have carried the gene that gives rise to the pointed color pattern. About his voice - although Siamese cats are known for their loud voices, I've heard of many who don't have the typical voice, and even some who have no voice at all! I think that to a certain extent, it depends what the kittens hear as they're growing up. What kind of voices do your other cats have? Thanks so much for sharing little Possum Blue with us, he's very cute! My oldest Siamese, 18-year-old Alvin, is a TALKER; the two 7-year-old rescue Siamese are meepers ... one is a very soft speaker and the other sounds like he is crying or talking to himself. We've had a total of five Siamese and out of that five we had one non-talker. Her name was Sofia and was a loving, wonderful girl until the day she went over the rainbow. We now have two chocolate points and they are making up for Sofia lol! They talk non-stop. As with people, Siamese all have different personalities.